At the Hiswa 2009 boat show we proudly presented the first official version of Sail Simulator 5. Developed using our new DirectX simulation technology for an extraordinary realistic sailing experience. For sailing select the spectacular Stentec Laser, the Dutch Valk National class (6,5m), the Dutch Valk National keel yacht or the fast Volvo Open 70 with adjustable canting keel. The fantastic sailing-island Cabrera was selected to become the meeting place for all sailors of the growing Sail Simulator 5 community. Cabrera is situated 10 nmiles south of Menorca in the Mediterranean Sea. A new addition is the area of Scheveningen, with (amongst others) pier and port. This makes it perfect for coastal sailing, as you may see on the figure to the right. The 470 Worlds will be organized here from the new regatta centre of the 'Watersportverbond' in 2010. 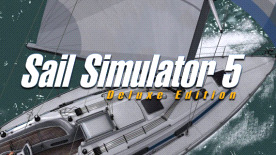 Sail Simulator 5 skippers have full control over the boat even in strong wind and high seas. Trim the sails and tighten the sheets to sail the boat at maximum speed. Organize multiplayer races with other users through the Internet or local network (LAN). Outside Cabrera and Treasure Island we defined two racing tracks. Wind and waves can be set before the race.